The master stateroom aft features a walkaround double berth, built-in nite table, dual hanging lockers, drawer storage, opening port, opening aft window/escape hatch and for entertainment a Toshiba TV. The ensuite head has a vanity with sink, vacuflush toilet, opening port, mirror and a large stall shower. The guest stateroom which is located forward features an offset double berth, bulkhead mirror, dual hanging lockers, drawer storage, opening ports, a large ventilation hatch and direct access to the guest/day head. The guest head which is located to port on the forward cabin deck has a vanity with sink, vacuflush toilet and a separate stall shower. The spacious salon features an L-shape leather sleeper sofa to starboard, built-in end table, cocktail table, built-in cabinets, area rug and a complete entertainment center with a JVC TV and VCR and a JVC AM/FM/CD stereo. Located down one step forward to port is an L-shape dinette. The entire cabin is spacious,, professionally decorated with matching fabrics, Corian countertops and cherry wood accents and is warm and homey. 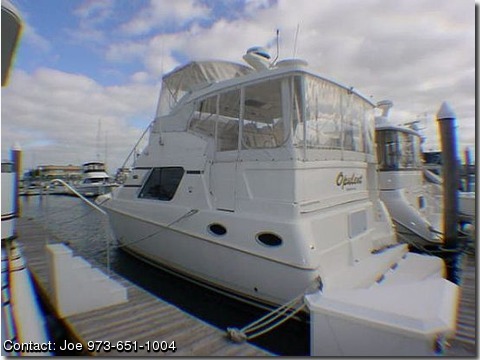 She is exceptionally well maintained, is spotlessly clean and shows as new. Located forward to starboard across from the dinette, the galley features a deep Corian sink, three burner stove with oven, full size refrigerator/freezer, Goldstar microwave, built-in Black & Decker coffee maker, Corian countertops, hardwood floor and plenty of cabinets and drawers done in cherry wood for storage.